On any given day, there are about 87,000 flights undertaken, and at any single moment, there are between 5 and 10 thousand airplanes (commercial and private) in the skies over the United States alone. According to the FAA, on an average day, controllers handle 28,537 commercial flights, 27,178 private flights, 24,548 “for hire” flights, 5,260 military flights, and 2,148 cargo flights. And these numbers don’t include private pilots who choose not to talk to ATC, as I often do when out cruising the neighborhood or when flying around non-towered airports. There’s so many airplanes up there at once it’s a wonder they don’t bump into each other more often. They don’t, it seems, because relative to the sheer volume of atmosphere in which they fly, all those airplanes actually don’t take up a lot of space. The relative volume of airplane to the volume of sky in which they fly being the reason that they don’t bump into each other more often is called the “big sky theory.” And statistically, given the ratio, the chances of one airplane bumping into another should be close to zero. But although it is happening less and less, it does happen, roughly a dozen times a year, especially in crowded airspace (such as busy airports) where airplanes are more likely to converge. The big sky theory, it appears, doesn’t work that well, because the statistical probability of it ever happening is very close to zero. Once, at a party in the living room of the Victorian house I was renting as a student with several roommates in Santa Cruz, California the math instructor and brilliant folk music satirist Tom Lehrer entertained us by demonstrating statistically that it was impossible to get wet when walking through the rain. Perhaps it was the blackberry brandy that mysteriously found its way from a bottle in my back pocket to my tummy that prohibited me from understanding the arithmetic, but his statistics appeared impeccable and his argument was compelling. Now, I may not be able to tell you the formula for chi-square off the top of my head, but I can work my way around ANOVAs, MANOVAs, and one of my favorite statistics (and Russian movie stars)—ANACOVAs, with fluency. Compared to highly trained academic statisticians, I still sit at the kid’s table, but I retain some perhaps egoistic pride in my ability to do discriminant function analyses, and I can work my way around most research articles I read. That is why Joel Best’s book “Damned Lies and Statistics” and its subsequent editions should be required reading for anyone who reads anything, pretends to know something, and hasn’t studied statistics. It should also be required reading for journalists, with whom I have particular antipathy for perpetrating the most heinous of statistical misstatements. 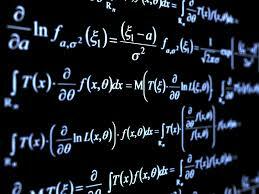 Theories can be extremely convincing, especially when backed by statistics. As an autism “expert,” I once described in detail the theory behind how the preservative thimerosal, used in the MMR vaccine, can cause autism. I had a room full of family practice residents convinced, possibly because I sprinkled the explanation with statistics. (The proportion of thimerosal in vaccines, the multiples of mercury based on the FDA’s own limits of safety, the correlation between mercury poisoning and autism symptoms, etc.) The theory can be made to look rather compelling, but it’s just wrong. These residents were smart cookies, but I could have just as easily convinced them that I had 11 fingers. One of the many problems with statistics is that it is a very poor method for predicting low-frequency events, such as rain in California, earthquakes, violent behavior, or midair collisions. It is nearly impossible to account for all the variables required for a low-frequency (or extremely complex) event to occur. The driveway to my domicile is located a half-mile up from a highway. Although I typically drive that half-mile slowly, the other day I had to swerve to avoid a squirrel that decided to dart in front of my car. Sadly for both me and the squirrel (but mostly the squirrel), we collided. If I had to create a statistical model that would attempt to predict the likelihood of me colliding with a squirrel down that half-mile stretch of road, I can assure you that it would reveal that colliding with a squirrel could not happen in thousands of lifetimes. Statistics, it seems, cannot take into consideration the notion that squirrels appear to have a robust death wish, or have a secret ritual in which the transition to adult squirrelhood is marked by darting across a road in front of Lexus crossovers with balding drivers. So, you see, it isn’t that difficult to prove, statistically, that it is nearly impossible to get wet when walking in the rain. And really, it should never be necessary to look out your window when piloting an aircraft because the chances of bumping into another airplane are infinitesimal. If you believe the statistics, that is. All the calculations show it can’t work. There’s only one thing to do: make it work. –Pierre Georges Latécoère, early French aviation entrepreneur. When I went to school in Murray, Kentucky, there were plaques around town that honored Nathan Stubblefield, the inventor of the radio. 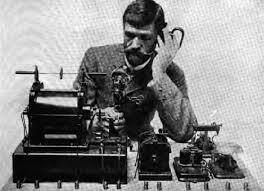 The inventor of the radio? I grew up believing that it was Marconi who invented the radio, although later on I learned that the guy who I thought invented the telephone actually held the patent for the radio, good old Alex Bell. I guess that when it comes to intellectual property and who reaps the benefits of their labor, the game of who gets credit for what is important. But for those of us who use toasters, it hardly matters who invented them. What intrigues me, especially as I travel to other parts of the world, is the extent to which nationalistic pride comes into it. Ask Americans who was the first to take flight, and they will almost certainly say it was one of the Wright Brothers. Ask that question in France, and they will tell you not only that the French invented aviation altogether, but they will reel off the names of Charles Renard, Henri Giffard and Arthur Krebs—all French of course. In Italy, they will mention DaVinci, although there is no record of Leo ever actually lifting off. They will, however, mention Tito Burattini, who successfully lifted a cat into flight in 1648 (but not himself). In Great Britain, they will tell you that it was Sir George Cayley in 1846, five decades before the Wright Brothers invented the “aeroplane”. Cayley began drawing pictures of airplanes when he was 10 years old, which was around 1792. In Germany, they will mention Gustave Weisskopf, who emigrated to the U.S. where he changed his name to Whitehead. In 1901, a year before the Wright Brothers’ flight, he carried out a controlled, powered flight in a monoplane in Fairfield, Connecticut. Although a story ran about it in the local newspaper, he obviously didn’t have as good a press agent as the Wrights, so he never made it into the history books. Or, perhaps, his neglecting to change his first name had something to do with it. National pride, I suppose, is primarily an extension of the instinct to protect one’s own tribe. Without tribal identity one vanishes into the whims of those who seek to conquer. Whether it is a good thing or a bad thing most likely depends on the outcome, and the question of who gets hurt in the process. In reading the history of the development of the atom bomb, for example, it seemed clear that national pride had little to do with getting there first. Getting there first was imposed by the circumstances, but those who labored to split the atom did so more out of the spirit of the challenge than out of tribal identity. I have been fortunate enough to know a few inventors, and none of them invented out of national pride. They did so because they had a creative instinct, a love affair with solving problems cleverly and doing things better. Money and credit are often secondary motivations. National pride seems to come into play more by those seeking to find a way to attach themselves and their identities to the cleverness of the inventors they celebrate. I may not have invented Swiss cheese, but you can rest assured it must have been another Eastern European Jew. We invent everything. What is most important is the spirit of invention itself, a spirit that has resulted for the most part in prolonged lives with less suffering. That is noble, and that is the thing to be nurtured. Some people I know fall asleep as easily as this laptop I am working on (and just as unpredictably). This is for the rest of us who have trouble finding the rest in us. 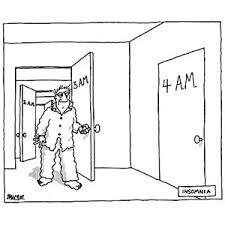 I have long suspected that most of my insomnia has been caused by anxiety, a slightly more syllabic way of saying fear. Fear, in my view and counter to Frank Roosevelt’s, is nothing to be afraid of and can be our best friend, but just like our best friends, sometimes our fears can talk too much and keep us up at night. I have used and recommended a few sleep-inducing tricks over the years (see last post), but the most effective one of all is good old-fashioned paradox. True insomniacs will tell you that staying awake can be just as challenging as falling asleep. That is because, as I mentioned in the last post, insomnia in its truest form is not really a state of being awake; it is a state of not being asleep. Different thing. It is the battle between sleep and wakefulness that itself is the problem. When the objective of the battle is to fall asleep, the insomniac finds herself failing continually. The failing becomes a source of tension and self-criticism, and it is all very exhausting, but not sleep-inducing. The failure to fall asleep is often the body’s way of saying that there are too many unresolved problems, too much that is not quite right in the world that cannot be solved safely enough to allow one to sleep. So, just as Captain Kirk solved the Kobayashi Maru test by not accepting the parameters of the simulation and then reprogramming the computer, one must change the parameters of the sleep game. Rather than try to fall asleep and repeatedly fail, try instead to stay awake. If you succeed at doing this, you may be able to work toward resolving whatever it is that may be keeping you awake, or simply stay awake long enough that sheer exhaustion will eventually overcome you. The key to staying awake is to stop trying to fall asleep. It is that shift of focus that eases the burden of the conflict and gives sleep a welcome place to reside. Get out of bed, fold the laundry, read a book, study a foreign language, or engage in whatever activity is leftover on the grand to-do list. The worst-case scenario is that you will be up all night and tired the next day. At work, you might have to fight the urge to fall asleep, but that is an urge you will be happy to have when you are home safe. Sleep may be “nature’s soft nurse,” but while she may be on call she may be attending to other patients and unavailable. In that case, try canceling the appointment. At least for the moment, you may not need her, and trust that she will come when she is needed the most. 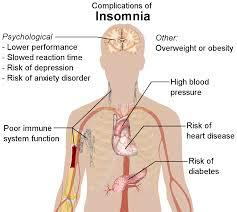 I have suffered from insomnia off and on nearly all my adult life, as do a huge number of folks. If you read what’s going around the internet and other fonts of wisdom on the topic of sleep it could scare you to death, or at least keep you up at night. Insomnia has been linked to diabetes, weakened immunity, weight gain and heart disease, not to mention accidents in which people fall asleep at the helm of whatever sort of chariot they are driving. I do like to remind myself though that aside from falling asleep at the wheel, if lack of sleep is going to kill you, it’s going to be a slow death, kind of like life itself. The first thing a good insomniac should do is get a medical workup. That turns out to be a productive path in only a very small percentage of cases, but in case you are one of those who suffers from treatable sleep apnea it may be a good idea. Many books and articles tout the benefits of exercise, timed to occur well before bedtime. Interval training may be a better way to go than pushing through a single strenuous workout. This seems to work really well with my dogs, who will sleep through the night if they get a lot of exercise during the day, but frankly it has never helped me much. Losing weight is almost always a good thing. That seems to help nearly everything under the sun, and research tells us that people who are thinner also tend to sleep better. I can tell you, though, I had just as much trouble sleeping when my BMI was 20 than I do now with a BMI of 26. My first-resort insomnia treatment is making lists. Transferring annoying things to do from brain to paper tends to ease my mind, allowing me to temporarily put the intrusive thoughts aside and trusting that the paper, if not my mind, will still be there in the morning. The second thing to do is reading something particularly boring, which, when I am half awake, is practically anything. The third thing I do is something writers, psychologists and hypnotists call “automatic writing,” which is simply letting your hand write whatever it seems to want to without giving the process any conscious thought. Sometimes surprising things appear, although I find that most of what I write in this state is indecipherable in the morning. But when those fail, I go to the surest thing of all, the ultimate, guaranteed insomnia cure: staying awake. True insomniacs will tell you that staying awake can be just as challenging as falling asleep. That is because insomnia in its truest form is not really a state of being awake; it is a state of not being asleep. This, it turns out, warrants its own post. More on this next week! In the Yiddish-speaking world from which my mother came, every compliment had a slight critical inference. Being called a “nice guy,” for example, implied that yes, you are nice, but you probably wouldn’t last long in the real world. Now, a large body of research supports the notion that being nice may not be so good for one’s health. Years ago I was asked to do a presentation at the Wellness Center in Pasadena, a place devoted to supporting cancer survivors. I knew my audience, all cancer survivors, was going to be well versed, so I boned up on the literature as best as I could, and I read hundreds of abstracts and several key articles on the relationship between cancer and anger, which was the topic I decided to speak on. The most recent literature associates “Type C” traits with autoimmune disorders, within which cancer can arguably be included. Saying though that cancer is associated with a certain personality type is a sticky wicket because anything that correlates personality factors with cancer can lead quickly to self-blame; after all, one’s personality is something one can supposedly do something about. So, as I say often, it must be emphasized that correlation does not equate to causality, but just gives us some things to think about. In a recent study at Stanford, hairless mice were exposed to ultraviolet rays for 10 minutes at a time three times a week for 10 weeks, exposure roughly equivalent to that of humans who spend just a bit too much time surfing (the real kind, with the ocean beneath them) or sunbathing. After several months, as was predicted, every mouse developed skin cancer. 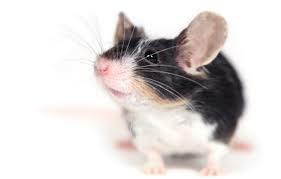 But here’s the rub: the “nervous” mice, that is, the ones who had proclivities for risk aversion and reticence (which had been previously determined by behavioral tests), had more tumors than the calmer mice and were the only ones to develop invasive forms of cancer. In this study, the researchers used measures of reticence and risk aversion to define a mouse as “nervous,” but it seems just as valid to call reticent and risk-averse mice “nice,” and besides, “nice mice” just sounds a whole lot better. Generalizing from mouse behavior to human behavior isn’t a terribly reliable thing to do, but it is necessary because doing this kind of research with humans raises some fairly significant ethical concerns. So, while we can’t say for sure that nice guys always finish last, at least for mice, we can probably say that nice mice come to a finish first. Study citation: PLoS ONE, online, April 25, 2012.